When dealing with the disabled among us we often confront a number of issues that are surprisingly uncomfortable. Even more so when faced with disability in our animal companions. True to the gift that they are to their human families, they bring us a deeper understanding and acceptance of ourselves. Franki ‘Blue Eyes’ Hoffmann was a most unusual Ragdoll cat. He started seizuring at nine weeks of age. I met him when he was 16 weeks old with a request from his family to try acupuncture to control his fits, or at least lessen their intensity. Blood tests, MRI scans and other diagnostic tests had yielded no positive diagnosis and so Franki was labelled an epileptic. Franki was a special cat, not entirely true to the Ragdoll nature but quite accepting of his lot. He initially visited once a week for needles. He was also taking anti-epileptic medication. The fits reduced in frequency and intensity. When Franki reached nine months of age, his guardian, Suzanne, asked me if we could swim him. She felt he was really slow (he was) and that his hind quarters were weak (they were). At this stage the underwater treadmill was not yet installed. I agreed and then the questions began: how would I swim a cat? What was the best way to introduce him to the pool? Was he brain-damaged? Could he process being placed in the water? And, could I elicit the desired swimming response? – which is usually instinctive? I started with a buoyancy aide (or life-jacket). Franki refused to move – both on the ground and in the water. I was afraid to drown him. We moved to a harness. Still Franki refused to move. I asked Suzanne to place the harness on him at home so he could become accustomed to it. I wanted a ‘handle’ in the pool! Franki sat in one place at home for two hours! To call him stubborn would be a gross understatement! Eventually I relented, and we (Franki and I) entered the water without any attachments. He refused to swim. After eight weeks of gentle encouragements and begging, I removed my hand, which was supporting Franki under his belly. He started to move his legs! Break through!! From that moment on, we progressed. Franki swam; we balanced him on a boogie board in the pool; and walked up ramps. 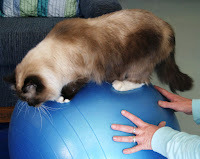 The treadmill was out of the question but he did balance exercises on the Pilates ball – until he punctured it. Franki was a regular patient for almost four years. He taught me patience and tolerance; he forced me to find new ways to achieve the goals I wanted. I would say that Franki was mentally disabled, but he had his routine, and he was a happy cat. What did I learn? Disabled pets cannot be managed by everyone, but we should give them the benefit of the doubt and try to find a way to give them a quality life. I am blessed to have known and worked with Franki. He showed me there are paths, even if mainstream society ‘says’ there are not. We have a choice – always. I love this story. It deeply challenges many of my preconceptions about having an animals companion. More and more I am realising that my companion has his or her own life path that I have been invited to share. I agree Kim. Slowly the world is awakening. I feel we have much to learn. Thank you Elna. Cats are very special, indeed!